The StayAt Hotel Parliament Helsinki is situated in Helsinki’s Tolo area, which is populated by picturesque old villas and boasts the nicest parks in the city. This nice residential district is located just a short distance from the city center. This convenient location places a plethora of shops, cafes, restaurants, and cinemas within walking distance. The Temppeliaukio Church, opera house, and Senate Square are just a few popular attractions that can be found near the property. Helsinki Vantaa Airport is just 15 kilometers from the StayAt Hotel Parliament Helsinki. 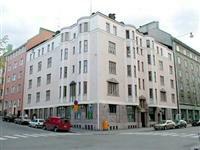 There are 43 spacious hotel apartments in the StayAt Hotel Parliament Helsinki. Each unit comes with a selection of modern amenities, such as a kitchenette, satellite TV, ironing set, and broadband Internet access. Guests can start each morning in the StayAt Hotel Parliament Helsinki by preparing breakfast in their own apartment or ordering something from the on-site restaurant. After an exhausting day of work or sightseeing, guests can watch a show in the television lounge or unwind in the sauna.